My Beatport DJ chart April 2016 is available! Some tunes are included in my Soundcloud Mix April 2016 aswell! My Soundcloud Mix April 2016 is available! My Soundcloud Mix Series is back with 16 fresh tunes mixed into just one hour! It features tunes and remixes by artists like Factoria, Ciaran McAuley, Chris Voro, Liam Wilson, Ferry Tayle and many many more! Stream+Download enabled, enjoy! Tic Tac Trance #100 Replay available! Happy birthday Tic Tac Trance! 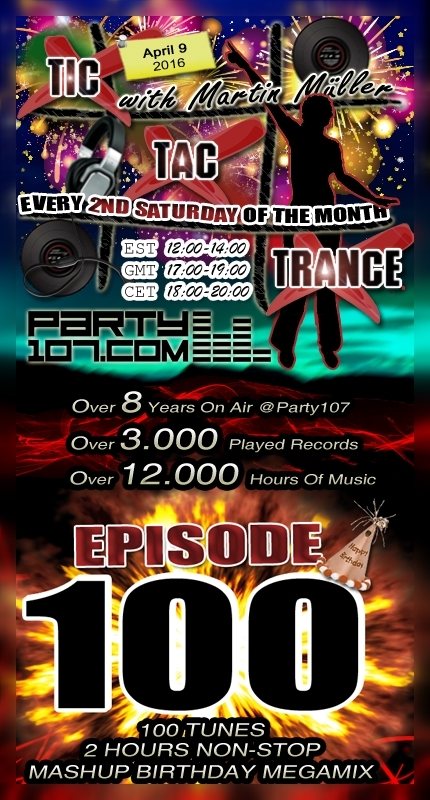 On April 9, 2016 episode #100 of Tic Tac Trance will air. After over 8 years on air presence, over 3.000 played records and over 12.000 hours of music, the anniversary edition of my radioshow is almost here! I’ve chosen 100 tunes from the episodes #001 to #100 and mashed them up to a special 2 hours megamix. A special thanks for faith goes to my radiostation Party107.com and Mark Kane, thanks for your support!